Editor’s Note: This month features sage advice from various service providers on best practices for making your community association operation run more smoothly. Portfolio managers are asked to serve multiple boards of directors and committee members, multiple groups of owners, multiple vendors, and multiple objectives with multiple definitions of success. They have multiple meetings in multiple communities which are often spread across multiple geographic ranges. The complaints they address, the tasks they undertake, and the governing documents they need to know are often several times more than the level required of other managers. By definition, managers with fewer communities have more time to plan and act strategically, more time to spend on site, more time to respond to issues and complete tasks quicker, and more opportunity to achieve a healthy balance between career and family than do managers with a greater number of communities. Board members should always consider manager workloads as they deliberate management company choices. Not surprisingly, the result is often happier residents, increased manager longevity, improved manager performance, and more successful communities. 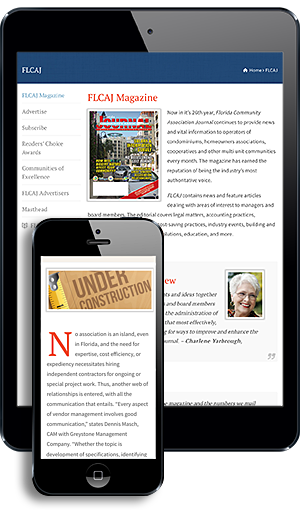 For more information on Aegis Community Management Solutions, call (863) 256-5052 or visit www.aegiscms.com. You want to buy into a financially healthy building. Having properly funded reserves in place makes it easier for your association to expedite the commencement of capital projects and ensures that matters such as municipal permitting, materials availability, and contractor advances proceed smoothly. It should be a red flag to you if a building you are looking to buy into does not have a fully-funded reserve fund. Look to see if there are at least two months’ worth of monthly assessments set aside to cover unanticipated costs that are not part of the reserve fund. Ideally, the operating fund (working capital) should equal or exceed two months’ worth of monthly budgeted assessments. Having a properly planned and adequate reserve fund, as well as sufficient working capital, demonstrates board discipline and healthy financial solvency. For more information on AKAM On-Site, call (954) 843-2526 or visit www.akam.com. ROOF MAINTENANCE, A GREAT INVESTMENT! Have you ever looked at your roof as a piece of equipment? In reality, it is like a piece of equipment that demands regular maintenance if it is going to protect the contents of the facility and last its projected life. Unfortunately, the roof seems to fall into the “out of sight, out of mind” category. It is not until the roof starts to leak or fail that the roof gets some attention. Even then, many times, the owner/managers are just interested in stopping the leak instead of correcting the problem. The “do nothing” form of roof management could be the costliest mistake any owner could encounter. A single, visual inspection of the roof and maintaining a detailed log of roof access are two great functions that are the start of a roof maintenance program. Someone should be designated as the responsible person for each building’s roofing system. This person should be familiar with the roof system, warranty, required maintenance, and a qualified contractor to perform the required maintenance. Directors should make every effort to hire a management company that’s neither too big nor too small. Larger associations with a long menu of amenities, extensive landscaped areas, and numerous employees need a larger management company they can depend on, while small to medium associations often fall to the bottom of the pile if their management company also serves large properties. Choose management that will treat your small- to medium-sized community with caring attention and responsiveness. References should include the size of the property so board members can judge if the fit between the association and management is right. Does the manager listen to residents and act quickly on behalf of association needs? Is the manager personally reachable 24/7? Does the manager effectively supervise their staff? Ask the right questions and you will enjoy a lasting partnership with your management company. For more information on Command Management LLC, call (305) 310-9800 or visit www.commandflorida.com. Once most owners and board members are convinced the work is necessary, the board needs to hire an experienced engineer to perform a survey of the building and then seek bids from qualified concrete restoration contractors with a proven track record to do this very important job. For more information on Concrete Restoration by Daniello & Associates, Inc., call (561) 835-4788, (888) 370-4333, or visit www.concreterepairing.net. One practice I use is the “proactive approach” to the property in the community. Collect a list of all the buildings that are the association’s responsibility to maintain per the declaration. Make a list of general maintenance tasks. Have board members make the decisions on how often “x” (the maintenance) needs to be done. Use columns such as monthly, quarterly, semiannually, and annually. Place an x in the column under each maintenance task so the manager is able to know exactly when the maintenance item is due to be completed. The manager can put this in her calendar to schedule a month earlier. This can be used in conjunction with the community’s reserve study to maintain the maximum life expectancy of the property before it is in need of replacement. This approach has allowed me to plan ahead for budgets and has extended the life of the item on property. For more information on Exclusive Association Management, Inc., call (386) 492-8066 or visit www.exclusiveassocmgmt.com. Continuous Improvement—Always strive to improve the client experience, and always challenge yourself to innovate and improve in everything you do. You should be vigorously engaged in providing constantly improving customer care for board members, homeowners, and professional partners. Reduce Expenses—Pay attention to costs and eliminate unnecessary expenditures for your associations. Speed Up Processes—Have a set game plan for handling inspections. Have easy to use forms to assist with writing up inspections. Always respond quickly to the needs of board members and homeowners. This will keep small problems and issues from escalating into larger issues. Time Management—Make sure that you are managing your time wisely. It’s a good idea to have a schedule that you follow to keep you on track of tasks. Utilize the Team—You are not alone. Be part of a team and use the team efficiently. Do the Right Thing—Show your integrity and commitment in everything you do. For more information on Vista Community Association Management, call (866) 682-3443 or visit www.vista-cam.com. It’s not surprising that attractive, well-kept community landscapes encourage more outdoor, physical activity among residents. Many residential communities offer walking trails and open green areas for residents and visitors to experience more of the great outdoors. In turn, more physical activity leads to an overall healthier and happier population in communities with professionally-maintained landscapes. High-quality, professionally-maintained grounds also create a sense of pride in community, which in turn encourages greater community involvement. When they see attractive green spaces, residents are proud of their community and want to share that pride with others. They also become fiercely protective of it. It’s not uncommon to see declines in graffiti and property defacement when there is a commitment to keeping landscaped spaces attractively and professionally maintained. Want to promote healthy living and create pride in your community? Your landscaping is the perfect place to start. For more information on Yellowstone Landscape, call (877) 785-6685 or visit www.yellowstonelandscape.com.